Offline - Mint Museum, Charlotte, NC. Western Reserve Historical Society, Cleveland, OH. (Search the collection). Barbour Bros. (c. 1888). Butter dish. (Object ID nos. 78.7.1.A-D. Viewed 27 July 2018. H00032-36). Barbour Silver Company. (1890-1900). Tray. Silver or silver plate. (Accession no. 2009.2.2. Viewed 11 August 2018. L00008). Historic New England organization, Boston. Barbour Silver Company. (1892-98). Tea set: teapot, coffeepot, sugar bowl, spooner. Accession no. 1980.236.452. Viewed 27 July 2018. H00031). Barbour Silver Company. (c. 1895). Spooner. Silver plate. (Cat. no. M-2016.Fic.064. Viewed 17 July 2018. G02887-89). Photo - Delta County Historical Society, Escanaba, Michigan. Barbour Silver Company. (c. 1895). Four vases. [Accession no. 2016.2.118.1(-.4). Viewed 17 August 2018. L00563-22(-25); L00564]. Offline - Clayton mansion, The Frick Pittsburgh, PA.
Photo - Art Institute of Chicago. The Barbour Silver Company became part of the International Silver Company in 1898. After this date, it is assumed that any design patents utilized by the Barbour Silver Company division or brand were assigned to the International Silver Company. (See the ISC historical documentation page). Photo - Winterthur Museum, Delaware. Barbour Silver Company / International Silver Company. (c. 1906). Loving cup, trophy. Silver plate. (Cat. no. 1991.026.007a-b. Viewed 11 July 2018. G02554-55). Photo - Chilliwack Museum & Archives, Chilliwack, British Columbia, Canada. Barbour Silver Company / ISC. (c. 1908). Trophy. Silver plate. (Cat. no. 1998.22.134. Viewed 26 July 2018. C00176). Photo - Washington State Historical Society, Tacoma. 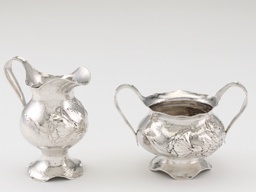 Photos - Dallas Museum of Art: coffee pot; creamer; and sugar bowl. Photo - Dallas Museum of Art. Click the following link to see the parallel webpage - Barbour Silver Company design catalogues and historical documentation. Barbour Silver Company. (undated). Silver tray. (Cat. no. P1985.35.4. Viewed 11 July 2018. G02552-53). Photo - Southern Historical Oregon Society, Medford, OR. Barbour Silver Company. (undated). Tray. Silver plate. (Cat. no. S6052. Viewed 18 July 2018. G02958). Washington County Historical Society, Hagerstown, Maryland. Barbour Silver Company. (undated). Teapot. Silver plate. (Accession no, 1972.16.4. Viewed 10 July 2018. G02471). Wellington Museum & Archives, Fergus, Ontario, Canada. Barbour Silver Company. (20th century). Tray. Nickel silver. (Object no. 1948.136.36. Viewed 9 July 2018. G02425). Barbour Silver Company. (undated). Tea / coffee service: teapot, coffeepot, sugar bowl and lid, creamer and spoon holder. Silver plate. (Cat. no. 75.21.1A-E. Viewed 22 August 2018. L00709). Barbour Silver Company. (undated). Napkin ring. Silver plate. (Cat. no. 64-22. Viewed 8 July 2018. G02400). Barbour Silver Company. (c. 1900). Art Nouveau footed center bowl. Sterling silver. (Viewed 2 July 2018. G02105). Photo - Bonhams Los Angeles - Art + Decor (14 DEC 2015). Barbour Silver Company. (late 19th century / early 20th century). Oval floral-and-foliate-decorated centerpiece bowl and stand. Sterling silver. (Viewed 2 July 2018. G02106). Bonhams New York - Fine American and European furniture, silver, folk and decorative arts and clocks (23 SEP 2014). Barbour Silver Company. (c. 1900). 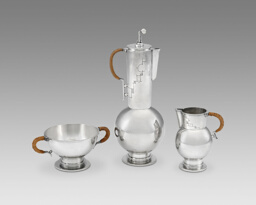 Three-piece coffee service: coffee pot, a cream jug and a sugar bowl. Sterling silver. (Viewed 2 July 2018. A03054). Photo - Bonhams Los Angeles - The elegant home (26 JUN 2018). Barbour Silver Company. (c. 1900; late 19th / early 20th century). Pickle caster with tongs. Silver plate, colored glass. (Viewed 15 July 2018. G02757). Photo - Bonhams San Francisco - SOMA estate auction (17 APR 2011). Barbour Silver Company. (c. 1900; late 19th / 20th c.). Three handle cup. (Viewed 15 July 2018. G02755). Bonhams San Francisco - SOMA estate auction (24 SEP 2006). Barbour Silver Company. (c. 1900; late 19th / early 20th century). Tall vase. Sterling silver. (Viewed 15 July 2018. G02770). Photo - Bonhams Los Angeles - Period art & design (21 APR 2013). Barbour Silver Company. (c. 1900). Vase. (Viewed 2 July 2018. A03050). Christie’s New York - Silver (9 JAN 1991). Barbour Silver Company / International Silver Company. (1900-50). Silver and enamel cocktail set. Sterling silver. (Viewed 2 July 2018. A03047). Photo - Christie’s New York - Living with art (26-27 JUL 2016). Barbour Silver Company / International Silver Company. (c. 1905). Pitcher with epousse grapevine cartouche and foliate engraving. (Viewed 15 July 2018. A03051). Christie’s New York - Important American furniture, silver, folk art & decorative arts (18 JUN 1998). Barbour Silver Company. (c. 1910). Bowl on four tab feet. Silver. (Viewed 2 July 2018. A03052). Photo - Christie’s New York - Fine American Furniture, Folk Art, Silver and Prints (23 MAY 2006). Barbour Silver Company / International Silver Company. (c. 1910). Footed salver. Sterling silver. (Viewed 15 July 2018. G02754). Photo - Bonhams Los Angeles - Period art & design (14 JUL 2013). Barbour Silver Company / ISC. (c. 1910). Loving cup, trophy. Silver or silver plate. (Viewed 15 July 2018. G02766). Photo - Bonhams New York - The gentleman’s library (20 JUN 2012). Barbour Silver Company / ISC. (early 20th century). Five-piece tea and coffee service: coffee pot, tea pot, covered sugar bowl, cream jug, and waste bowl. Sterling silver. (Viewed 15 July 2018. G02765). Photo - Bonhams Los Angeles - Period art & design (29 APR 2012). Barbour Silver Company. (c. 1920). Set of twelve, octagonal cups and saucers. Silver or silver-plate. (Viewed 2 July 2018. A03053). Christie’s New York - Important American furniture, silver, folk art & decorative arts (23 JUN 1993). Barbour Silver Company / International Silver Company. (20th century). Twelve silver dinner plates. (Viewed 2 July 2018. A03048). Photo - Christie’s New York - Important English, Continental and American silver (22 MAY 2008). Barbour Silver Company / International Silver Company. (20th century). Table serving pieces. (Viewed 2 July 2018. A03049). Christie’s New York - Christie’s Interiors (9-10 FEB 2010). Barbour Silver Company / International Silver Company. (20th century). Rectangular tray, with applied fruiting grape vine rim. (Viewed 15 July 2018. G02756). Photo - Bonhams New York - Property from the Wanamaker - De Heeren Family Collection (22 OCT 2008). Barbour Silver Company / International Silver Company. (20th century). Two Revere-style bowls. (Viewed 15 July 2018. G02753). Photo - Bonhams San Francisco - Period art & design (10 NOV 2013). Barbour Silver Company / (ISC). (20th century). Nut bowl with squirrel-form feet. (Viewed 15 July 2018. G02769). Bonhams Los Angeles - Period art & design including jewellery (12 NOV 2012). Photo - Bonhams San Francisco - Period Art & Design (19 AUG 2012). Barbour Silver Company. (undated). Tea caddy. (Viewed 15 July 2018. G02767). Bonhams San Francisco - Period art & design (24 JUN 2012). Barbour Silver Company & International Silver Company (designs unspecified). (undated). Various items: vegetable dish, footed oval well & tree platter, plates, bread & butter plates. (Viewed 15 July 2018. G02768). Photo - Bonhams San Francisco - Period art & design (22 JUL 2012). Click the following link to see designs and documentation for other historical silver companies from the Meriden area, and those that were connected to the International Silver Company; go to the historical Meriden design overview page and scroll down to section B: "ISC, predecessors & divisions" and C: "Other featured companies". 29 March - 3 May 1925. American industrial art: Ninth annual exhibition of current manufacturers designed and made in the United States at Metropolitan Museum of Art, New York. > Exhibited unspecified designs by Barbour Silver Co. / International Silver Co.
For documentation, see the Design Meriden - Barbour Silver Company design catalogues and historical information page. > Exhibited unspecified designs by Barbour Silver Co.
> Venues: Renwick Gallery, Smithsonian American Art Museum, Washington, DC; Nevada Museum of Art, Reno; Dallas Museum of Art; The Wolfsonian, Miami Beach, FL; The Dixon Gallery and Gardens, Memphis, TN. Online - interview of curator Jewel Stern, [Design Meriden at artdesigncafe.com, 1(2), 2016].